Agatha “Aggy” Grae was only 10 years old the night a witch of the Umbra Coven killed her mother and burned her home. Injured, she received a transfusion of blood tainted by witchcraft, and immediately her eyes were opened to the truths hidden from mundane eyes. She saw a new world, a hidden world, one filled with darkness and secrets. And that new world was now aware of her. Through the years, Aggy never quit hunting the mysterious coven. From the shadows she gathered information, stepping out only to hurt those who dared to hurt others. But everything changed the night she helped a familiar looking stranger. Through magical means, Vanessa, a high witch of the Umbra Coven, has learned of Aggy. Following the orders of the coven's leader, The Veiled One, Vanessa has begun her own hunt, one that can end only with Aggy's blood. She Dreams of Fire is a story of strength. In order to survive, Aggy must defeat her own doubts, addictions, and fears. In order to win, she has to endure everything the witches and the Hidden Folk throw at her. Partnered with a man from her past, the unlikely pair must learn to trust each other as they suffer betrayal, discover hidden truths about themselves, and battle the monsters in the dark. But does Aggy have the strength to walk through the fire? 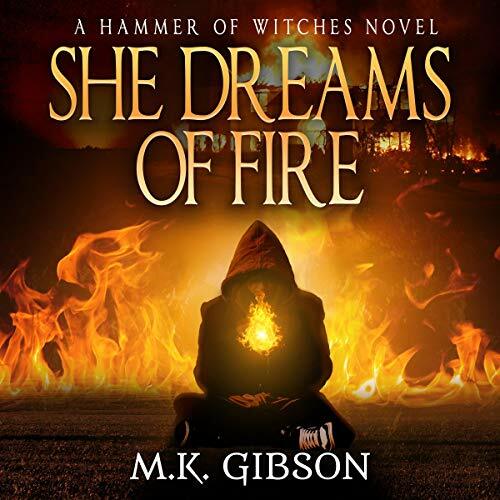 SHE DREAMS OF FIRE by M.K. Gibson is a prequel to his wildly entertaining fantasy cyberpunk Technomancer series. The premise is a young woman has her family murdered by agents of a murderous coven of witches. Surviving to adulthood but becoming addicted to fairy blood along the way, she ends up with a talking carnivorous rabbit and a vigilante serial killer akin to Dexter. It's an entertaining novel with Michael Gibson's typical brand of humor, oddball characters, action, and fun. Too much urban fantasy tries to be knock offs of the Dresden Files or Mercedes Thompson (both series I love but which have been copied to much). Instead, the author has established his own voice. This is great summer entertainment and the perfect book to read just for fun. Some people may object to the use of evil witches as an enemy or the real-life book title for the series but I think they worked quite well in this volume. Amazing narration too. I can't wait for the sequel! This is a new series by M.K. Gibson. I’ve listened to his work in the past with The Shadow Master series. It is a series I’ve really enjoyed with some dark humor to it. So, when I was given the chance to try a new series by him, I jumped at the chance. The fact that Xe Sands is the narrator was an added bonus. This story follows Aggy. A woman with a difficult past. Her mother died when she was a child. Actually, that’s way to tame. Her mother was murdered and burned to death as she hid in from the murder. But she was a small child (six, I think), what else could she do. There is also Marcus. He is former military and an EMT who found her and gave her a transfusion from the man who killed her mother (who didn’t live long from the injuries he received from the mother). That changed Aggy’s life forever. Many years later, Marcus is now a doctor and saves lives. Aggy struggles with her life. She has a drug problem and a therapist. She also has a pet rabbit, who is a great character in this book. She also has a great friend in Ji. Lastly, I need to tell you about the villain, Venessa. She’s a cop, but also a witch. She works on cases for both the coven and the human world. She isn’t a good witch or a good cop. She does whatever it takes to get the job done. She has no problem sacrificing human or supernatural to get her job done. And I mean sacrificing in the literal sense. This is a great first book in a dark urban fantasy series. It has the right combination of suspense, mystery, and great characters. I really liked the mythology in this story. Some of it I was somewhat aware of, others, I’ve never heard of. While there isn’t as much humor as in The Shadow Master series, there is still some humor involved in the story (her aunts and Ji are great). Xe Sands does a really good job with the narration of this series. There is a vast array of characters and she voices them all really well. I really enjoyed her voice for Ji, who was very flamboyant. She did a good job with both the male and female voices and the tone of the scene. If you haven’t tried her, I highly recommend her narration.